This is an excerpt from this weeks premium update from the The Financial Tap, which is dedicated to helping people learn to grow into successful investors by providing cycle research on multiple markets delivered twice weekly. Now offering monthly & quarterly subscriptions with 30 day refund. Promo code ZEN saves 10%. This week, Crude put in one of the best single week rallies on record. Such a move was obviously not the result of bargain hunters or demand buying; it was driven purely by overly-leveraged speculators covering Short positions as the market turned higher. Once such moves get going, they often take longer than six sessions to resolve, so I expect that Crude will continue higher in the coming week as traders continue to cover their Shorts. The 2nd rally in the current Daily Cycle is beginning to take shape now, and I expect Crude to hit a new Daily Cycle high near the end of the week. 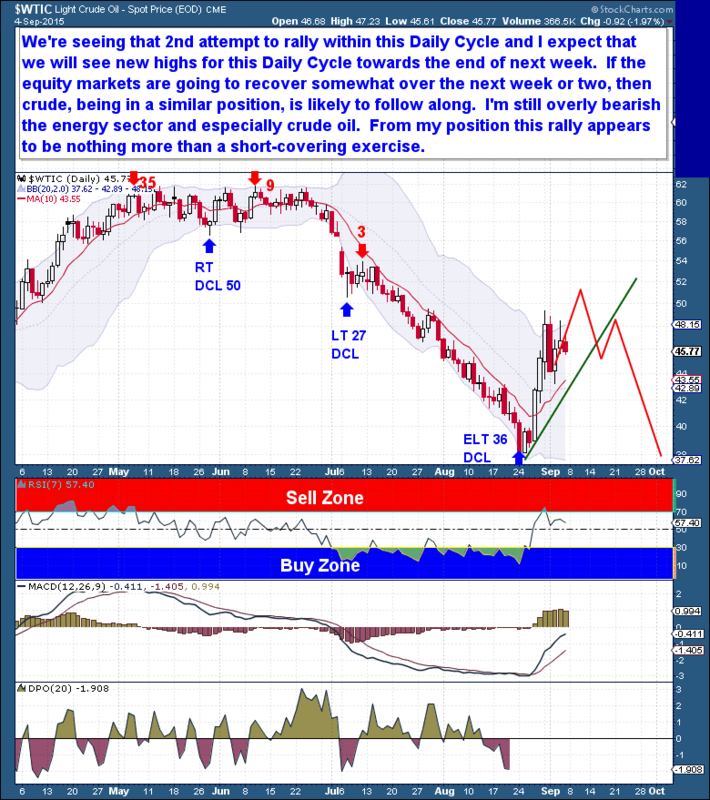 If the equity markets are going to recover somewhat during the next 2 weeks, then Crude is likely to follow along. But I’m still very bearish on the entire energy sector and especially Crude oil. From my perspective, the current rally is nothing more than a Short-covering exercise. My primary concern for the energy sector is that far too much Crude supply remains on world markets. And with lower prices causing fiscal problems for the oil-producing nations, I don’t expect a meaningful reduction in world oil supply for a long time to come. In fact, with this week’s news that President Obama has the necessary votes to ensure the survival of the Iran nuclear deal, we’re going to see another flood of Crude hit world markets at the start of 2016. Even though the sector has entered a bear market, its participants are either unwilling or unable to see the longer term implications of their actions. As with every bull-to-bear market transition, the players that are heavily dependent the sector are too biased to appreciate (or admit) that there are bad times ahead. 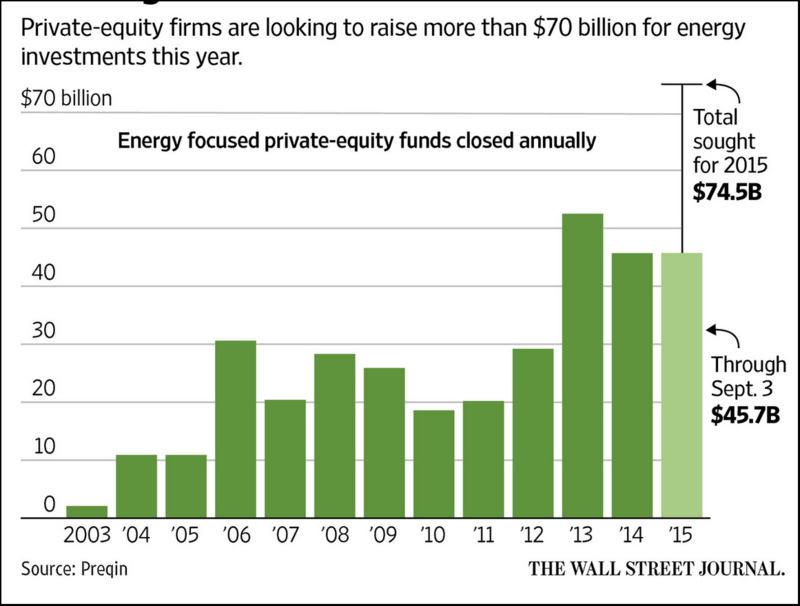 After years of absolutely massive capital inflows into the energy sector and despite currently depressed prices, the industry is on track to raise a record $74 billion in 2015. And with world Crude demand relatively flat, the additional $74 billion is only going to ensure that supply continues to constrain price. 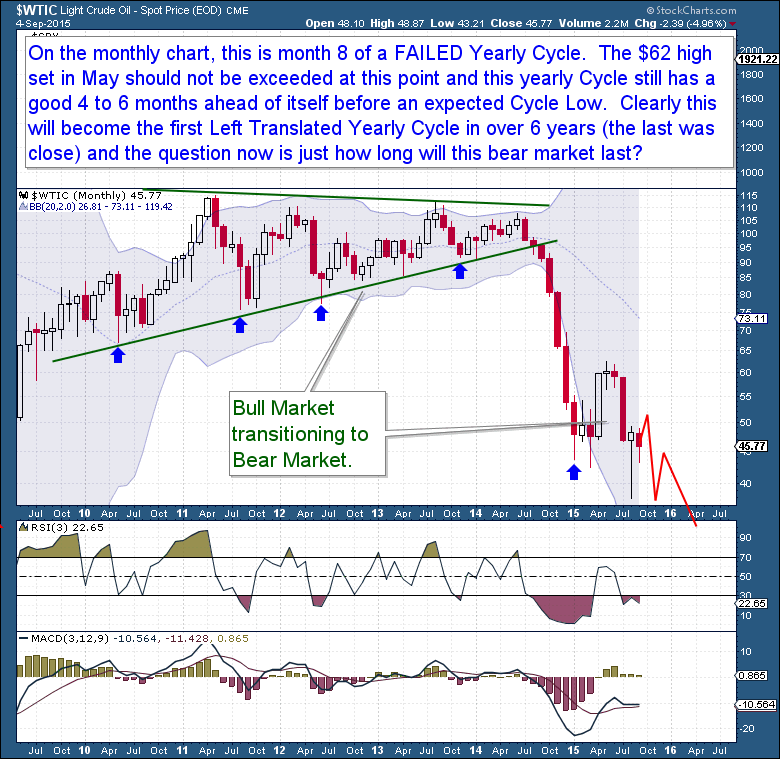 Moving to the monthly chart, Crude is in month eight of a failed Yearly Cycle. The chart below clearly shows that Crude oil is locked in a cyclical bear market that could take years to resolve. But whatever the longer term outlook, timing dictates a minimum of 4 to 6 more months of lower prices before a Yearly Cycle Low arrives. If that’s the case, the $62 high from May is almost certainly Crude’s ceiling and should not be exceeded during the current Yearly Cycle. As the current YC continues, it should become the first Left Translated Yearly Cycle in over 6 years (the last one came close), leaving the primary question now as to whether we’re seeing a short 1-2 year correction or the start of a larger, secular bear market.